"SO MUCH MORE than a Century Ride"
The Ride --Southern California meets Italy in this celebration of cycling, food, and San Diego’s picturesque water front. 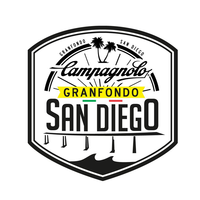 Held in beautiful Downtown San Diego, the two-day festival features a mass-start, timed GranFondo with 4 route options, timed King and Queen of the Mountain, The Cycling, Health, & Wellness Expo with local Community Bike and Fitness Speakers, challenging and picturesque routes, outstanding Campagnolo ride support, and delicious food on course. The Party ---You will be cheered into the finish line, awarded your medal, and ushered into enjoy the Fantastic Finish celebration with live music, bike valet, Italian Pasta Festa, Beer Garden, and a well-deserved massage. Please check Opening and Closing times and plan accordingly. Remeber to ask your company about thier matching gift programs. Routes are subject to changes due to road conditions, weather, emergencies, and county or city regulations / mandates.